Surfing the Southern Baja and Los Cabos provides diversity in location, break direction and level of difficulty combined with unique coastal scenery and beaches known worldwide. When it comes to the where and when, the rules are pretty simple. Spring and summer belong to the Sea of Cortez; during fall and winter, it’s best to head to the Pacific side of the Cape. Of course, you can surf both sides year-round, but like anywhere else, timing means everything and certain times of the year are just historically better than others. Time to grab your board and pack your vehicle. Los Cabos is surrounded by never ending beaches but the following are the best breaks Cabo has to offer. Monuments is a left point break that can get a little tricky. This spot is best saved for the seasoned or expert surfer. You’ll find this break just east of Cabo San Lucas off of Highway 1. Look for a statue or monument at the entrance near the Cape Hotel in the Cabo corridor. The break is located below the hotel. Monuments can offer decent size breaks even when the rest of the area is flat. World famous Zipper’s beach is the closest break to San Jose del Cabo. Located just west of the town, it offers up a fun, fast right break and is the site of numerous surf competitions. Unfortunately, with fame comes crowds and if you are hoping to find a wide-open ocean, chances are you won’t. If you can handle fighting for position you will be rewarded with a nice long ride as the reef structure creates a long break when the size is there. Find the Holiday Inn Hotel at the north end of Hotel Row in San José del Cabo and walk out to the beach. This is a sandbar break that can get good especially after storms have built up the sandbar. Left and right breaks can build to double overhead but watch out for a mean shore break at low tide. A newly paved road takes you from downtown San José all the way to the coast road at Playa Tortuga on the East Cape. Just north is Shipwrecks, one of the more famous breaks in all of Baja. The drive into this area boasts some of the most spectacular coastal scenery you’re ever likely to see. Two miles from the paved road, the first break is just below a steep rise. Shipwrecks is most productive during a strong southerly swell. Keep driving northward to find Nine Palms, Punta Perfecta and Los Frailes. On the way from San José del Cabo to Cabo San Lucas, this is a right breaking swell that offers good surfing for beginners as well as advanced surfers. Another good spot along the Costa Azul shore this is also a right break forming off a rock outcropping. On a good day, the ride is a bit over one hundred yards. Light swells produce 3-4 footers but the occasional push from tropical storms can push it to 6-10 feet in the right swell. You will find this spot in the middle of the Cabo Tourist Corridor adjacent to Chileno Bay. This is a strong break that goes both ways with speed and is best left to the expert surfer. North along HWY 19 on the Pacific side toward La Paz leads you to the small enclave of Cerritos. Cerritos Beach is famous offering good surfing year-round. For the novice or experienced surfer, one can find that perfect wave day after day. Cool off with a refreshing beer and some great eats at Cerritos Surf Colony. Tell them I sent you! 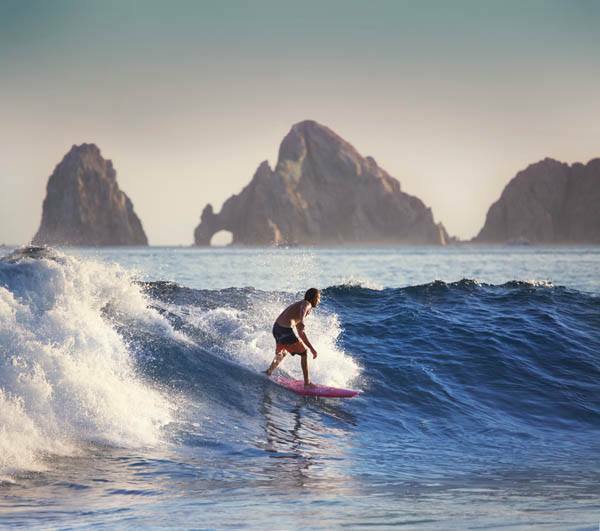 Los Cabos is known for its forever beaches and endless surfing. Although some surfing spots are more popular than others, you can find a great break just about anywhere. And remember, even if you don’t surf, the lifestyle can be enjoyed by everyone. It’s all a part of living in Cabo.